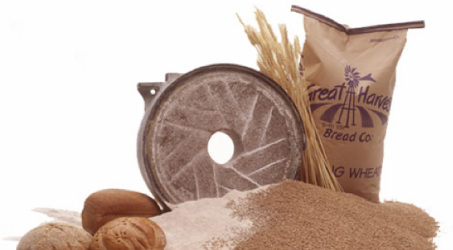 We feature freshly-ground 100 percent whole wheat flour! At Great Harvest, we believe in providing customers with awesome-tasting products. Not only do our products taste better than the average baked goods, but our freshly-milled whole grain wheat flour assures that we’re delivering nutritional value. Studies show that the fresher foods (such as milled grains, vegetables, and fruits) are, the better they are nutritionally. All of our products are made from scratch -- no mixes or frozen dough. We mill our whole wheat flour fresh daily on stone or hammer mills. Whole wheat kernels are poured into one end of the mill and come out the other end as 100% whole wheat flour. There is absolutely no separation of flour components; nothing added or taken out -- just pure fresh flour from the whole grain. We’ve always known fresh ground flour tastes better. We’ve even done lots of blind taste tests just to prove what we’ve know intuitively all along! Now we know the fresh flour is better nutritionally as well. When a kernel of wheat is milled, all parts of the flour start to oxidize as they’re exposed to the air -- the germ, which contains free fatty acids, is particularly vulnerable to this oxidation. Simply put, if milled whole wheat flour is not used fresh, it goes rancid. Using our flour within a day after it is milled assures that the nutritive value of our products is the best it can be.